The all new Google Phone aka Nexus One is all the talk at the moment and we have found some very nice pictures of this device being unboxed via Redmond Pie. Above you can see the Google Nexus One box design, of course we are not sure if this is the final design but at least you get an idea of what it may look like, the first unboxing pictures has been leaked via djrobrob on twitter and got to admit pretty impressed so far. It does show you that it will be a Google branded phone, the phone itself has been designed by Google themselves and the hardware is manufactured partnership with HTC some say that this new handset looks a lot like the HTC Passion/Dream which is also set for release in 2010. 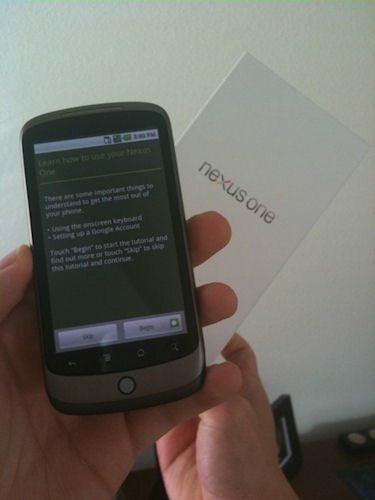 The Nexus One will be Snapdragon 1 GHz processor powered and will ship with the all new Android 2.1 OS preinstalled; there have been rumours of a January 5th release date and a price tag of around US $199 for the subsidized version. Please check out the quick video below where you will see the animated background wallpapers; please also let us know what your thoughts are on this all new mobile phone. Next article Next post: Will iPhone 2010 Surface at WWDC 2010 for Verizon? looks good and easy to use would love one .